The world’s purchase decisions now start and end on the web, social media and, most of all, with mobile devices. 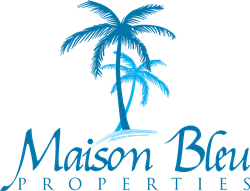 Maison Bleu Properties, a real estate brokerage with expertise in data-driven, digital marketing announces the availability of their full-service realty to buyers and sellers of homes and land on Florida’s Emerald Coast. Founded by serial entrepreneurs and local residents Jason and Rebekah Polancich along with partner and broker Shaina Hershey-Sly, the brokerage represents a new level of real estate marketing in the area that gives buyers and sellers the highest level of satisfaction in their transactions. The Maison Bleu approach is not just about sophisticated software techniques and data, however. The company’s founders are also family-oriented and focused on creating a small, comfortable feel for the firm centered on highly-personal service. They’re also local. The firm’s future plans include expansion into the luxury Emerald Coast real estate market by using the same proven, digital marketing techniques designed to attract high net-worth clientele and real estate investment to the area.